The other day I got an email from one of our commenters, Peter (from Computer How to Guide) in which he said that I had been nominated to continue his ‘7 Links Challenge‘. After reading Peter’s article, I did a bit of digging and managed to find out what the 7 Link Challenge is, and who started it off. 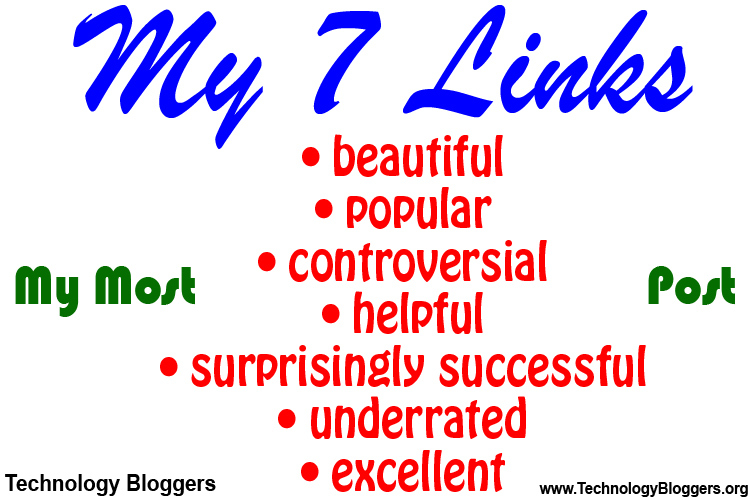 The 7 Link Challenge (or My 7 Links as it is called by its founder) is where a blogger writes about seven articles they have written, and then nominates other (usually five) bloggers to do the same. It is an interesting idea with three obvious intentions: firstly to create awareness of ‘posts gone by’ (old posts which have sunk into the archives); secondly to create a flow of PageRank, or ‘link juice’ between a whole host of different blogs, ultimately pushing everyone up the rankings – in theory; and thirdly to drive more traffic to different sites, by bloggers raising awareness of other blogs that they read or contribute for. I think Technology Bloggers could benefit from such a post, and I would like to dig back into the archives and find my seven articles, so I am going to give it a shot! A bit of an odd name, but I guess this means a post you feel is brilliantly crafted/well written. This one was an easy one to pick, I just had to see which posts had been read the most, and which had the most comments. That post was: Is your computer damaging your eyes? The post has had hundreds of views, 37 comments to date, and users spend on average over four minutes on the page, making it the overall most popular post that I have written. I hate to sound like I am chickening out again, but I am really not sure what to pick! I try to make sure that most of my posts stir up a bit of a debate, but again, no one really stands out for me. Do you think I have a most controversial post? I like to think that all my posts are helpful, either by updating you on the latest tech news, by reviewing a product, or by telling you how to do something. The post that should be crowned my most helpful post really depends on who you are. If you are a blog owner who wanted to find out how to claim your blog with Technorati then that article was probably the most useful to you, again, if you were interested in new radiotelescopes, The world’s most powerful radio telescope is now functioning! is probably of more use to you. What do you think my most helpful article is? There are a few posts which I was surprised with, either because they didn’t really get the response I thought they would, or because I was pleasantly surprised by the response. I have chosen an article which pleasantly surprised me, as I shouted out to the community, and the community responded! That post was: Why would you turn comments off? you can read the follow up post here: Why you would turn off comments. Looking through all my old posts, this one jumped out at me straight away, as I remember how stunned and please I was when I wrote it. There was no other post that I could be more proud of (yet) than this one. You – If you have a blog, I challenge you too! If you want to find out more about My 7 Links, click the link and it will take you to what I believe to site of the founder of the challenge. Thanks, Christopher. I’ll start working on my post. I have read it now Lillie, any you made a really good job of it! Thanks again, first an award, now a challenge! I will start now and post next week. That is a really cool idea, I will have to do this on my blog.